Most people think about India as a subcontinent with one billion people, as the land of such major world religions as Hinduism and Buddhism and more recently as the new outsourcing destination for the whole world. Evangelicals may think about India as a mission ground, where some of the pioneers of protestant missions as John Carey have struggled to bring the Gospel to the Indian masses. Orthodox Christians know that India is also the land where Apostle Thomas went after the disciples were dispersed from Jerusalem. The one who once doubted the resurrection, went to proclaim it and died as a martyr in the place where today stands the city of Chennai, formerly known as Madras. In December 2007, as I took my seventh business trip to India, Chennai was my primary destination. I left Washington DC in the evening, on a Qatar Airlines flight to Doha, Qatar. As the lights of a super-civilized Washington were left behind, the plane, an Airbus 340, crossed Maryland and followed the American east coast above New York and Boston. After three hours the lights of the great North American population centers were left behind and I knew I was flying above the Canadian wilderness and into the night over the Atlantic. The sun appeared to the east when we crossed Ireland and England. Europe was covered with clouds and I could not see, as many times before, the beauty and majesty of the Alps. I flew over my country of origin, Romania, and I knew that at a certain point I was just a few miles from my hometown of Alba Iulia, where my 82 years old mother was praying for me in the very house where I grew up and lived for 18 years. The clouds dispersed above Turkey, and the ground was clearly visible above Syria. I could only see roads crisscrossing a barren land; maybe one of them was where Apostle Paul had his encounter with Christ, on his way to Damascus. Soon I was flying above the desert of Saudi Arabia and after fourteen hours of flight the plane started to descend, made a large turn over the Persian Gulf and landed in Doha. Arriving at night in Chennai, the western traveler feels the smells of the East, strange odors mixed with the fragrance of exotic fruits. The heat and humidity of the day lingers long into the night, even in the middle of the winter. In the absence of efficient public transportation, the western traveler relies on the car and driver usually sent by the hotel to pick him up from the airport. During the 30 or 45 minutes trip, at two o’clock in the morning one can see peasants summarily dressed pulling charts stacked with fruits. Even at night Chennai is full of color and activity and one can easily anticipate the explosion of life that comes with the day. Once the traveler enters the hotel, he finds a completely different world. The hotel is luxurious and magnificent and it caters to every need of the guest. While the streets are filled with poor and emaciated people, the hotel pulls back no expense to make the American or European traveler feel comfortable. When I arriver for the first time in India in, August 2000, I was assaulted by beggars in the parking lot of the airport in Calcutta. It was a mixture of sick people, children and mothers with babies in their arms. I tried to behave like a good Christian, giving away the few dollar bills that I had with me. I run out of these while a larger crowd was forming around me and I had to gently push my way to the car. For the few poor that got something, there were ten others left behind. I remembered the words of Christ, “the poor you always have with you.” I found that here in India good intentions run against the practical considerations. While I was getting in the car with a sense of embarrassment, the driver was shouting at them to clear out and make space so we could leave. Here in the United States we think about the poor in terms of a one or two people that stand out in the middle of a well-to-do crowd. Giving alms to the poor is thus simple and easy to accomplish. In India it’s different. You can only start to sense the size of humanity that lives in poverty when you see the large crowds sitting or walking on the streets. What can you do for them? You are usually in a clean, modern car, safely isolated from that sea of humanity in which one subsists for a few dollars a day. Even with the best intentions, what can you do? When a sixteen year old girl with a baby in her arms smiles at you and extends her hand asking for money, the driver looks very nervous if you open the window to hand her something. You scramble through your pockets hoping to find something before the street light changes from red to green. You may give her a few rupees, but there are thousands others that you see on the same street, and your rupees make no dent in the general poverty. How do you react to this? One may think, “thank God I am not like them,” or “now I really feel rich and superior.” One may feel guilty for not doing more. One may pray also for the poor. Not being able to do more is in a way a humbling experience. As a limited person you should try to occasionally help at least the few whom God has physically brought closer to you. Since independence, Indian governments have tried to fight poverty in various ways. They took practical approaches, which worked slowly, but with some visible progress. There are hospitals and schools for the poor and there are strict laws against the caste system, which for previous centuries or millennia has pushed the poor behind a barrier that they could not cross. There is still a lot of indifference, part of it because of normal human nature, part because many have became immune at the spectacle of huge masses of poor people. In this land of great poverty and great richness one may find suffering and indifference to suffering. One may also find that certain moral values are more prevalent that in the West. Such is the case with the sexual mores. True, there is prostitution in India and an alarming spread of AIDS, which the government fights by various means. On the other hand, the westerner is surprised by the modesty of dress and the general negative attitude towards sexual immorality. Divorce is almost inconceivable and perhaps confined to the westernized Indians. The movies are not allowed to show sexual situations, the actors are not even allowed to kiss on the screen. In the typical Indian movie, a young unmarried man falls in love with a young unmarried woman, fights family and circumstances, and when he marries her the camera does not invade their physical intimacy. Marital infidelity is rarely portrayed or alluded to and unlike in western movies, it is greatly disapproved. While in the West we challenge authority, Indians respect it. There is place for both attitudes. Jesus rebuked the corruption of the religious leaders of His day, and at the same time told us to give Cesar what is Cesar’s. I think that the tendency for total rejection of any authority is an unfortunate trait of the Western culture. Indians tend to respect both the person and his office. Some think that this may be counterproductive in some circumstances. As the outsourcing industry has exploded in India, some Western companies find to their delight that Indian employees always do what they are told. They tend to agree with and to execute every order, even those that are obviously wrong. I’ve seen the difference in outsourcing between the Russian engineers and the Indian engineers. The Indian engineer will say, “Yes, I will do it” if it is good or bed, while the Russian engineer will say, “Wait a minute, there is a better solution,” even when the Western client is annoyed being challenged. The same humility is apparent also at a personal level. I had the privilege to participate in a business meeting with one of the founders of a multi-billion Indian company that employs over 50,000 people, most of them software engineers. I was impressed by his simplicity and humility. He was soft-spoken, to the point that he looked timid. One of my American colleagues praised him: “You must be proud of what you have accomplished. You not only created a great company, but also pushed your city and your country to a new level of prosperity and civilization.” He gently brushed it off, without false humility, saying, “I believe you exaggerate a little,” then he changed the subject. I immediately imagined how his American equivalent would have lunched in a self-aggrandizing speech about his great vision for even greater successes. The joke about Larry Ellison, the CEO and founder of Oracle in United States is that he is different from God, in that while God does not think that He is Larry Ellison, Larry Ellison thinks that he is God. Many Indians are also religious. They are not aggressive, but at the same time not shy about it, unlike in the West, where we generally feel that it is wrong to display any religious signs in the public life. As an Orthodox Christian, I noticed some of the physical aspects of the Hindu religion, which thus involves the whole person not just the mind. In the middle of my week in Chennai, my driver changed his clothes from the Western to the Indian/Hindu style. He did not wear shoes any more. As I asked, He explained to me that he is entering a fasting period, with significant restrictions on food and clothing. This was to last for about a month and conclude with a week in which he will withdraw somewhere in a hilly area in the South, for a time of prayer and meditation. I could not avoid the comparison to our Orthodox Lent, and while he drove me through the crowded streets of Chennai, I took advantage of this subject to describe to him what we Orthodox Christians believe and do. He was a little surprised at the similarities, as he previously thought that Christianity is just a religion of the heart, that knows little about consistent prayer and fasting. I recognized man’s need to break the rhythm of everyday life in order to seek God and seeing how serious he was, I felt ashamed for those times when I approached Lent superficially and mechanically. 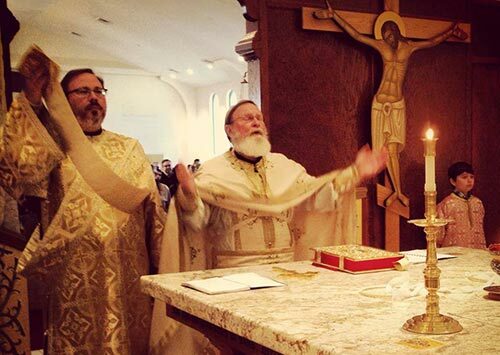 Lent should be more then “not allowed to eat this, but you can eat this.” Just as religious Indians try to occasionally isolate themselves from the tumult of life, we Orthodox Christians also have a great tradition in this respect, which we should fully pursue. The Desert Fathers have shown us that it can be done to highest level and in the Church we learn how to do it al least according to our abilities and circumstances. During one visit to a client I saw on his office wall a large image, strikingly similar to an Orthodox icon. I asked him what it was, and he answered that it was a representation of an avatar of the Hindu god Krishna. Like the saints in our Orthodox icons, Krishna looked pensive and totally disconnected from the miseries of earthly live. The background of the image was like gold and he had a hallo around his head. As a Christian, I know that Krishna is not a true god. In fact, the Hindu gods are actually improperly called gods, as they are neither omniscient nor omnipotent. They have the same essence as the humans, only in a higher state of refinement, being detached from the passions of life. In that respect they are more similar to the saints then to God Himself. However, while the saints whom we venerate were real historical people, and Christ Himself took a human nature and lived in the days of Pontius Pilate, the Hindu gods are legendary characters, without a precise anchor in history. Images of Krishna, as that which I saw on the office wall seem to suggest that the same essence as that of humans can become purified and radiant. We also believe that human nature can be purified and penetrated by God’s energies. Our icons are testimonies that man can become like God, not by nature, but by grace. Such images are speaking about the desire of the human heart to rise at a higher level of existence, fulfilling its true destiny. Not all Hindu images are beautiful. I saw from outside Hindu temples in the middle of the city, with a great number of ornaments and statues of avatars of various Hindu gods. Unfortunately, they do not always express majesty and generosity. Some of them seem to speak of evil and destruction. This is one place where the Hindu religion and our Orthodox faith part ways. We have different goals and we have different ways to get there. I was never a specialist in Hindu religion, nor have I studied it systematically. I had the opportunity to learn a couple of things about it in the past, as for instance when as a teenager I was reading Bhagavad Gita. I have also learned a lot during my business travels to India. The Hindu religion is one of the oldest in the world and it has a considerable volume of ancient writings. It is very complex, with many branches, books and teachers. Unlike the Christian Church, it does not have any systematic organization; it has no hierarchies and any form of central authority. As many world religions, it is a mixture of deep ideas and false concepts, of glimpses in the nature of man and universe mixed with sometimes naïve ideas. It is a human attempt to answer man’s desire for what is pure and divine. As an Orthodox Christian I can see where it falls short in this attempt. Bhagavad Gita is an epic poem that exposes many of the ideas of Hinduism. Prince Arjuna is about to go to battle and feels hesitant because he will have to fight some of his own relatives, friends and teachers. He has a discussion with his charioteer and guide, the god Krishna, who gives him a vision about the universe and advises him to pursue the battle, but detached from the feelings he had at that point. Krishna’s discourse describes some of the central ideas of the Hindu religion. In Hinduism there is no personal god. The ultimate essence of the universe is Atman, from which all souls derive. Atman is infinite, eternal and impersonal. But how can something impersonal be self-subsistent? If there is sense to existence, how can this sense derive from something without a reason and a goal in itself? According to Hinduism, the souls have their origin in Atman, they are Atman. Their misfortune is to get entangled in the world, with its miseries and passions. There is a kind of salvation in Hinduism, through disentanglement from the passions of the world. One may see the parallels with the Orthodox spirituality, at least in that we believe that we need to detach ourselves from passions and from the world, even if physically we remain here. The question is, to what end? In Hinduism the believer is hoping that through some series of incarnations – which are otherwise inevitable – he can slowly detach himself from the cycles of the world and advance towards a pure state, a Nirvana. Here I believe that the Hindu religion falls short of man’s desire to fulfill his human nature, which inevitable involves relationships with others. To reach his full humanity, man needs to love and live in community with man and God. This need to love and be loved is not addressed in Hinduism, which promotes a stoicism without real hope. One of the most important pronouncements of Krishna in Bhagavad Gita is that one must plant a tree without expecting its fruit. The idea of a selfless good deed is beautiful, but again it falls short of human nature as created by God. In the Christian faith the same metaphor would be different: we would say, plant a tree, and hope for its fruit, knowing that in God’s economy every good deed will make you and the world better. Do not hold to it, but hope, knowing that God, the Lover of Mankind will make it good for you. A Personal God gives you the seed, you, His child plant it, then God makes it grow and gives the fruit back to you, and you can in turn give it back to Him or to others, in an unending cycle of faith, hope and love. One “technique” on the way to salvation is meditation. There is however a difference between Hindu and Christian meditation. Transcendental meditation, for example, attempts to eliminate any content in order to achieve an empty mind. A Christian may meditate on the law of God, as he is told in Psalm 1, or can contemplate the beauty of the Creation, which ultimately leads him back to a Personal God. I admired an Indian acquaintance that sometimes in the middle of work suddenly withdrew to perform his meditations. It just happened that this person was egotistical and self-centered (and I’m not claiming that all Hindus are the same). Christian meditation should bring us closer to God, should fill us with His love and help restore His likeness in us. This hard stoicism that attempts to disentangle man from desires without offering a real hope helped preserve the castes system in India and the poverty that comes with it. The rich are not taught to give or to show compassion, while the poor are taught to simply accept their part in life. In the West we have learned to forever fight for our rights, in India people have learned to take it as it is. The Apostle Paul strikes the right balance: “Art thou called a servant? Care not for it: but if thou may be made free, use it rather.” True Christianity promotes freedom and compassion, but neither violent revolution, nor fatalism. There are also Christians in India. They are not just Evangelicals or Protestants or Catholics converted by the Western missionaries over the last centuries, but also of an older lineage, coming all the way from Apostle Thomas. These descendants from Thomas are spread mostly in the South and are unfortunately separated in a number of denominations. Some were folded in the Catholic Church, which during the papacy of John Paul II tried to bring as many oriental Christians into its arms. Unfortunately I am not aware of any significant Orthodox Christians in communion with the canonical Orthodox Churches. I enjoyed finding a Christian island in the Hindu sea. The church is not very large, at least not like the European cathedrals, and it can accommodate about 500 people at one service. On Sunday morning there are three services and the church is filled at each one of them. Next to the church itself there is a Catholic school and a museum with relics. I joined the congregation in singing and watched the whole mass, without participating myself to the Eucharist. I was also a little disappointed. I expected a more traditional Catholic service, but I found it to rather resemble an Evangelical one, maybe with the exception of the Eucharist and the priest’s vestments. I recognized some of the hymns from the Evangelical churches I used to attend before becoming Orthodox. Later my driver took me to a place where he heard that there might be an Orthodox Church. I found something, but not what I hoped. It was an old Armenian church, perhaps built by Armenian merchants a hundred years ago. It was in repairs; there was no service and there were no people around. India prides itself as a country of religious tolerance. The three main religions, Hinduism, Islam and Christianity generally coexist without problems. The Muslims are concentrated in the North, the Christians on the two coasts and in some large cities, while the Hindus are everywhere. From time to time some small religious conflict flares in violence, particularly between Hindus and Muslims. Knowing the gentle style of the Hindus, I personally tend to blame just one of the two sides. There is little antagonism to Christianity, and if there is it could be explained mostly by the bad memories of the colonial era. I saw once an interesting scene in Bangalore. I was at the third floor of a modern building, looking through the window towards a busy street. I saw three women in vestments, with their heads covered coming from one direction, and three others in somehow similar vestments but of different colors, coming from the opposite direction. Soon they passed next to each other, without recognizing one another. I asked one of the Indian engineers who was next to me who these women may be. He told me that in one group there were Muslim women, in the other Catholic nuns. I immediately thought about it as a beautiful picture of different religions being able to live together in peace. Without having any practical ideas, but I know that the Orthodox faith would be an answer to the Indian search for God. Our faith shows the way to “disentanglement from passions” sought by the Hindus. To the Hindu temples where people enter to worship the images of their gods in the middle of the day we can offer Orthodox churches in which one can venerate the saints and worship Christ in front of the icons. They use fragrances in their temples; we have the smell of incense in our churches. They have fasting and prayer to gods that are less then divine, we have fasting and prayer to the truly divine God. Devout Hindus are generally gentle people, displaying humility and peace. We value the same traits in the Orthodox Church, but to all these we add love. The good Hindus love their wives and children even if they do not have a theology of love. We can teach them the love of God, which in turn could be reflected in our love for those around us. Somehow I feel that Orthodoxy could touch the Indian soul much more then the Catholics or the Protestants. The later are handicapped by a long history in which Europeans were seen as empire building oppressors. The Catholics have simply absorbed the remnants of Apostle Thomas churches. They also have a couple of bridgeheads in India, from the colonial era, like that in the city of Goa, a former Portuguese colony. However, the more rationalistic style of the Protestant and Catholic faiths is further away from the Indian soul then the mystic theology and the ascetic traditions of the Orthodox Church. In India one must get used with different scales of reality. The cities are huge. I have traveled to Chennai, a city of 6.6 million people, to Mumbai, of 18 million people, to Calcutta of 13 million people, to Bangalore of 5.5 people and to the “tiny” city of Pune, of 3.4 million people. Chennai happens to be in the state of Tamil Nadu and the preponderant Tamil minority consists of about 57 million people. How can I think of it as a minority, when the country in which I was born, Romania, has a total population of about 22 million? It is hard to think about these numbers. They take some reality when it takes you two or three hours to cross the city of Mumbai, through the busy streets and the unending masses of people. How could God care for this great mass of people, all made in His image, all in need of salvation? When you try to think of the billions of galaxies with billions of stars imagination comes to a halt. You can write and say the numbers, but they are meaningless. The same happens when you think of the billion people on the Indian subcontinent: it’s pure statistics. Stalin said once that killing a man is a crime, but killing a million is a statistic. But for God, the one billion people are not a statistic. He knows and cares for each one of them. This is the mystery of God’s unbounded power, knowledge and love. The Indian Information Technology outsourcing industry is in itself a miracle. I visited a number of companies, of which some have over 50,000 engineers. They pick up IT projects all over the world, of every kind and size, from the financial and manufacturing industries to governments and non-profits. Today when you look at your bank statement it is very probable that the program that produces it is maintained by Indian programmers somewhere in Chennai, Bangalore, Pune, Mumbai or Calcutta. In one company they told me that they are hiring about one thousand new programmers per month. I asked how is that possible, and I was told that the company has a “hiring factory line,” in which a candidate enters on one side and exists on the other, most often with a good job offer. Next day he moves to a training program, staffed by hundreds of specialists, then directly to new responsibilities. One can make a career and become a project leader and then a manager in two or three years. The market abounds with job offers and the Indian software engineer can always find something more interesting or better paid. The same jobs disappeared from United States or from Europe. When I started my career in IT, I used to read that for at least one hundred years the demand for IT specialists here would continue to grow. The help wanted pages of New York Times were filled with ads looking for programmers. It looked like it could only get better for us. But this prophesies proved to be false. There is no safety in the world apart the one in God’s arms. I am fortunate and blessed to still have a job, but that is not true for many other talented people whom I know. I met in India an English colleague who told me his sad career story. After working for about twenty years as a programmer, he lost his job, no doubt in part because of the booming outsourcing in India. He lived for a while on unemployment benefits, than he tried desperately to find a job. It was all in vain, he could not find anything. He discovered that many programmers have found a new life as plumbers, so he went to enroll at a technical school for plumbers. To his horror, he found that there is a six months wait. He finally found a job with a software company doing business in India. As far as I know, at this time he is again unemployed. In the meantime, people with just a tiny experience as compared with his are happily employed in India and are considering jumping to yet another job for some better pay. Sic transit gloria mundi! So passes the glory of the world! Two hundred of years ago, he would have been a powerful employee in the British West India Company, living in a small palace in Madras, ruling over the lives of thousands of poor Indians. Today these Indians glow in their hope for a better life, while once again he looks for a job. As Mary the Theotokos proclaimed in her Magnificat song, God “scattered the proud… and filled the hungry with good things.” No, there is no safety in armies and horses. I arrived in Chennai at about two in the morning and I left at about the same time. I flew back to Doha, Qatar and from there to Washington, then to Raleigh. When I embarked in Doha, I found myself next to an interesting character. Tall and strong, looking like a Viking, but was a German oil exploration engineer. He was also a convert to Islam. He told me his life story. He was from East Germany, the grandchild of Baptist missionaries to Africa. The fall of the Berlin wall found him in prison, where he was serving time for an attempt to cross the border to West Germany. After reunification he could not find a proper job there and immigrated to England. He met Muslims there and converted to Islam. Later he found a job among Muslims in Dubai and a Muslim wife in United States. My conversation with him was interesting, but not very pleasant. I found it sad that the grandchild of Baptist missionaries could not find fulfillment for his religious longings in Christianity. Somehow I understood why. Christianity appears so diluted in the secular West Europe, that it is almost invisible. People are looking for something more real, something that would touch their lives, not just their minds, something with structure and tradition that can offer an anchor in life. He thought that he found it in Islam, where life is more regulated, where people prostrate themselves and pray together several times a day. His story reminded me of something I’ve witnessed in Amsterdam, just some weeks before, during another business trip. I was visiting a cathedral converted into a museum, and I asked a guide if they ever have religious services there. She looked at me as I was asking a stupid question and answered, “Of course not!” In the evening I had dinner with some Dutch partners, and one of them exclaimed, “I really wish we had here in Holland some of those ceremonies and feasts that the Catholics have!” I told him, just as later I told my Muslim companion that not all Christianity is so washed out, that we have an Orthodox Church in which we pray, fast and also celebrate the feasts. The Muslim convert next to me was very aggressive. You expect a convert to be enthusiastic about his new faith, but he proceeded to attack Christianity with a lot of stories and speculations that were far-fetched and ugly. His aggressiveness contrasted so much with the gentleness of the Indians that I have left behind. After a while he told me he has to say his prayers and I took advantage of this to move to another seat, where I was alone. As he was attempting to locate the direction to Mecca, I started to say my Orthodox prayers alone in my seat.